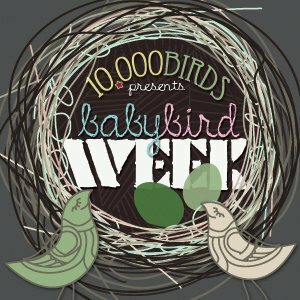 Life is hard for baby birds, as the world is filled with reasons why they might not make it too adulthood. Starvation and predators make it hard to grow up, and birds have evolved a lot of strategies to give (at least some of) their chicks the best chance in life. One strategy that varies among birds (and other animals) is the number of offspring. Some birds pump em out by the dozen in the hope that at least one or two survive. Others invest much more effort into fewer young, giving a smaller number a much better start. Seabirds are one group of birds that go for the latter strategy. A few families have a small number of eggs in the clutches, like gulls or cormorants. Others, like the petrels and some of the auks, will lay a single egg per breeding attempt. The investment placed in each clutch bur seabirds is so great that only one breeding attempt can be seen to completion each year. For the larger albatrosses and the frigatebirds it is common to take longer and have rest years between attempts. The auks, which range from puffins to guillemots all the way to the tiny auklets and murrelets, are typical for seabirds, long lived with tiny clutches of one or two eggs. One North American species I am very familiar with is the Cassin’s Auklet, which ranges from the end of the Aleutian Islands to California. Unless you spend much time on their breeding islands it is probably not one of the better known species of alcid, it is small and nondescript even as auks go. Indeed they look a lot like the diving-petrels of the southern hemisphere, short winged and with a gular pouch to store food. On the breeding colonies you’d never know they were around during the day, as these small seabirds only return to their colonies at night. They are cavity nesters, breeding in natural cavities or holes dug into the soil. At night they are very noticeable, however, individuals wizz past you on their way to their burrows, and pairs call in a rather unmelodious fashion from their hidey-holes. Most birders don’t get to see Cassin’s Auklets (Ptychoramphus aleuticus) like this. The one on top blinked I think. The Cassin’s Auklets of the Farallon Islands, where I encountered the species, have been the subject of a long term study going on for decades. 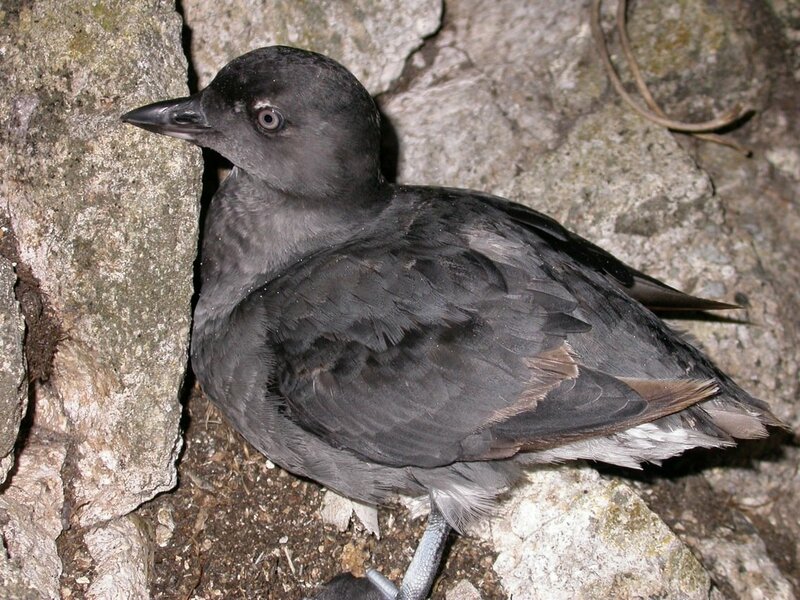 The species readily takes to nesting in small artificial boxes, and the scientists of PRBO Conservation Science have over 450 such boxes scattered across the island to monitor the species. With years of banding they have a large cohort of known age birds which they have been able to follow at every stage of their lives, a priceless resource for a scientist interested in in the life-history of a marine bird. 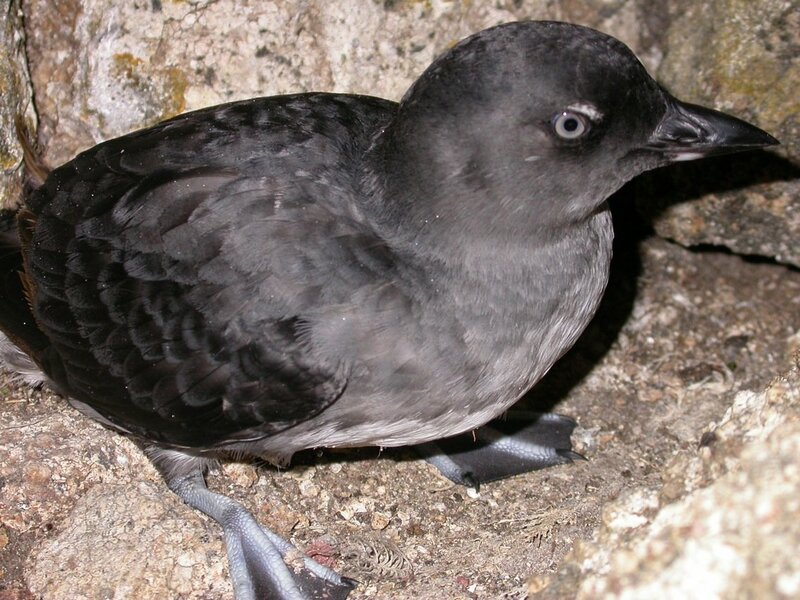 Cassin’s Auklets feed on krill, and the researchers of PRBO have been able to show strong correlations between sea temperatures, the krill that the Cassin’s Auklet feeds on, and the reproductive success of the birds. 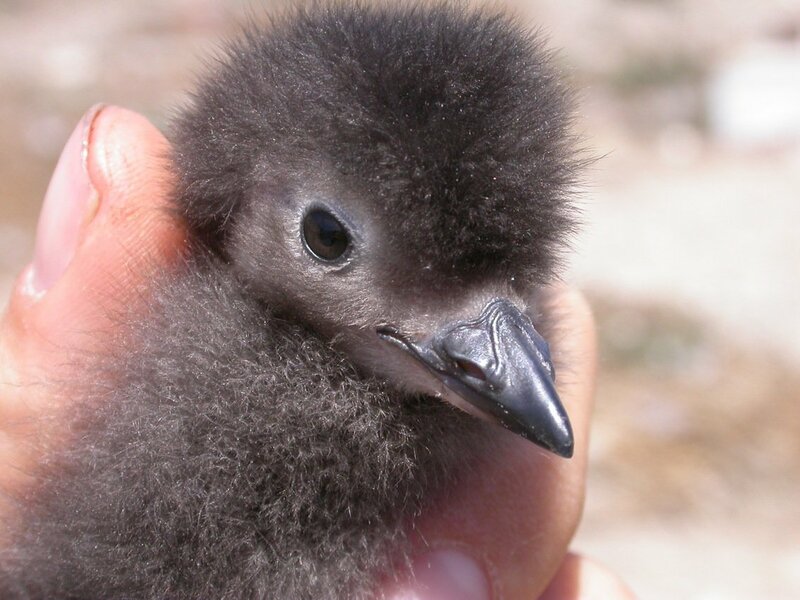 The chicks of Cassin’s Auklets are semi-precocial, and quite frankly adorable. This one is only a few weeks old, still covered in downy feathers, one of the birds from the study boxes. The Cassin’s Auklets do something else that is very interesting. Unique among the auks, indeed among seabirds, they will attempt to double brood, to lay another clutch after successfully raising the first chick. 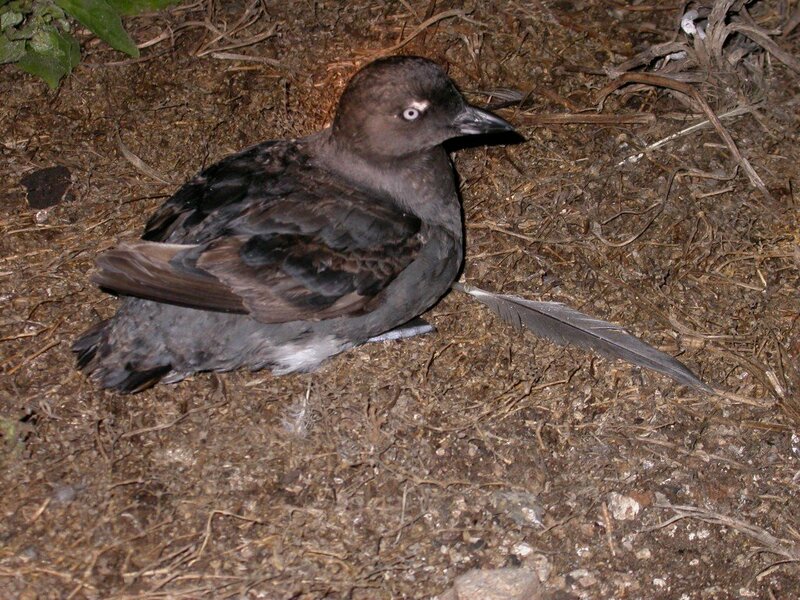 On fledging the young Cassin’s Auklet receives no further help from its parents (unlike murres for example), and in the Farallon Islands alone the exhausted parents may attempt a second go. In bad or even average years these attempts are rare and don’t succeed, as it was for the years that I worked on the island. So why do it? Well, on good years, really good years, it works a treat. In 2010, the best year on record, 75% of the pairs that raised a chick to fledging attempted a second brood, and 75% of those actually managed to fledge a second chick. Overall the reproductive success of Cassin’s Auklets that year was double the mean. So let’s hear it for the hard working scientists and volunteers of PRBO, who have shown the value of long term studies in finding out these interesting stories. 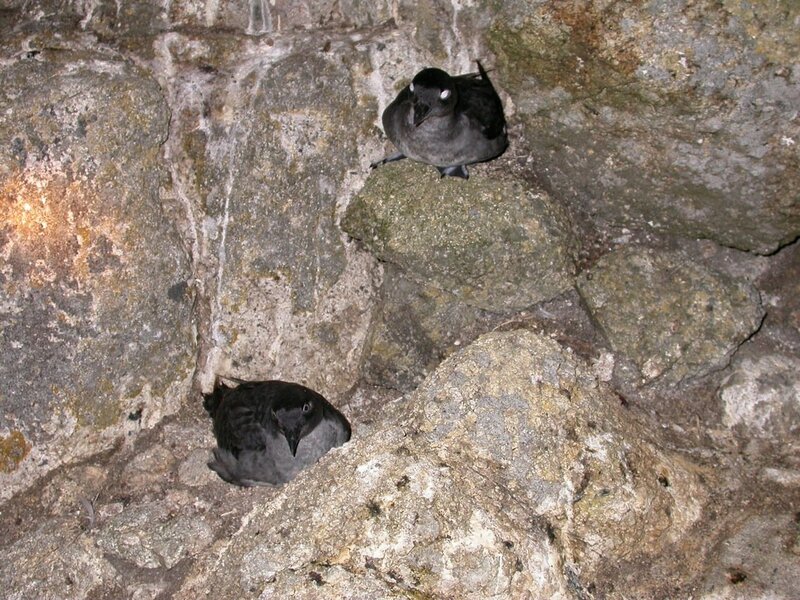 And let’s also hear it for teh hard working Cassin’s Auklet parents who are able to up their game in the good years. Very cool bird Duncan. Are the populations of them relatively stable? 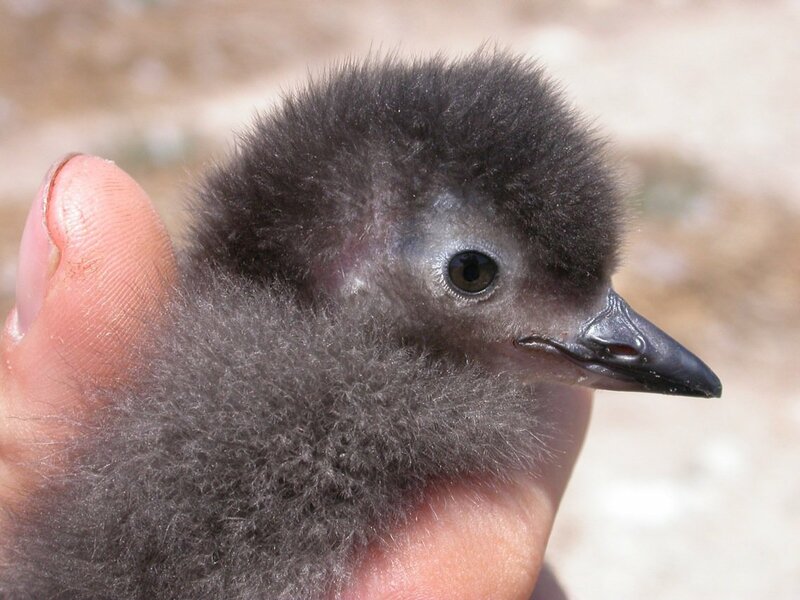 Wow, could that auklet be any cuter? Clare – Generally yeah. They have bad breeding years as well as good ones, but on the wholes adult survival is good. Mike – You should see the hatchlings! I don’t have any photos, nut I do of Pigeon Guillemots, a future post I suspect. Cool success story! It’s nice to see them up close too. The fuzz-ball pics are killer. Interesting post. What adorable chicks! 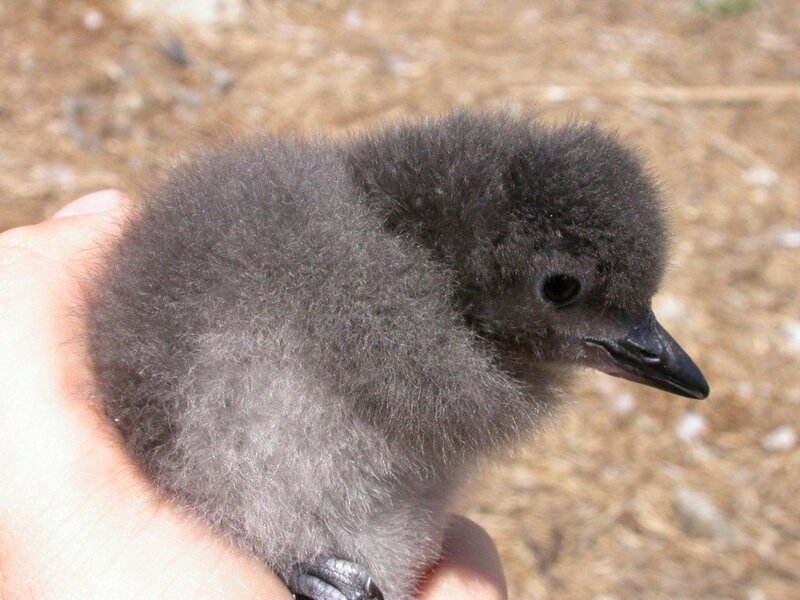 I’d never seen photos of baby Cassin’s Auklets before, and look forward to seeing your photos of baby Pigeon Guillemots. I see the adults every day here where I live. You are so right that PRBO is a fabulous organization. My first birding field trips were in Point Reyes with the incredible Rich Stallcup.